Not long ago, defence of migrants, the right to cross borders to live and work, and the project of lowering, not raising, borders, were common sense for most of the left. Blaming migrants for the problems facing working people, and demanding that borders be tightened – this was the territory of right-wing demagogues. But in the wake of the Brexit referendum, it’s a different story. Seemingly left-wing arguments for further restrictions on migration are gaining currency. But do these arguments hold up to scrutiny? Labour and trade union activists are coming together in a new initiative, the Labour Campaign for Free Movement, to make the case that they don’t. We are standing up for an unapologetically left-wing commitment to both defending the limited degree of free movement that exists now, and extending it further, as a matter of workers’ rights. 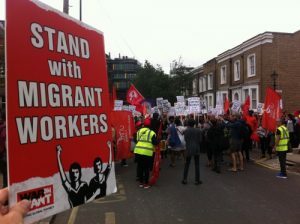 Some argue that the Labour Party can implement progressive migration controls that benefit workers by “controlling the supply of labour”. What is missing here is an acknowledgement that the supply of labour is not an inanimate raw material but human beings – other workers. So these calls amount to nothing more than a request for the state to ramp up the machinery of border controls – barbed wire, raids, deportations and precarity – to discriminate against some workers for the supposed benefit of others. This is not a new theme. As the newly-elected Labour MP Lloyd Russell-Moyle pointed out last week, demands to discriminate between workers by nationality echo the male trade unionists who protested against women entering the workplace. Those on the right side of history saw an alternative to clinging onto the prevailing hierarchies and prejudices. At its best, our movement strove to organise workers on equal terms, across divides like race and gender, to win a better deal for everyone. The solution is no different today. Labour and trade unions must stand for workers of all backgrounds. We need to build strong trade unions that win in the workplace, and fight elections with policies that promise to raise wages, tackle rents, build homes, secure workers’ rights, and invest in public services – for everyone. Going further, we also have to confront the underlying assumption that immigrant workers undermine the wages, conditions and job security of domestic workers – the contention that an increase in the supply of labour drives down the price. Intuitively, this makes sense. Unfortunately for proponents of immigration controls, it’s just plain wrong. Before the referendum, researchers at the LSE crunched the numbers. They showed that immigration from the EU has not been significantly linked to wage cuts, unemployment, or deterioration in public services. And it’s not surprising. Migrants don’t just work, they need to eat, drink and live: an increase in population doesn’t just raise the supply of labour, but the demand that creates jobs too. It was always a lie that migrant workers are to blame for low wages, unemployment and precarity. Unfortunately, a concerted effort by the racist right has made it a widely believed one. Labour’s role must not be to concede to this lie, but to debunk it and to place the blame where it belongs: with the rich and powerful, and the right-wing government that helps them to cut our wages and services, and concentrate more and more of our society’s wealth in the hands of an unaccountable elite. Labour has to explain that it’s not free movement that threatens workers, but anti-migrant policies (as set out in this article by another supporter of our campaign). Whether by denying them access to the welfare safety net, threatening them with deportation if they lose their job, or rendering their work status outright illegal, measures that push migrant workers into precarity make it easier for employers to turn the screws on their wages and working conditions, undercutting everyone else’s too. Pro-worker, pro-migrant socialists have a big task in front of us. Even before the looming threat to European free movement, non-European migrants already face harsh treatment. Xenophobia dominates the media narrative, and sadly these right-wing lies have gained a lot of traction. For some, acknowledging that reality means playing to its tune. Last year, Stephen Kinnock framed his call for Labour to appeal to white working class voters by embracing immigration controls, as opposing “identity politics”. But the real identitarians are those who patronise workers by acting as if xenophobic ideas are particular to working class people and fixed: a fact of nature to be either navigated around or marketed to, rather than debated. If the rollercoaster ride of the snap election proved anything, it was this: Labour can win enormous gains, not by conceding to a prevailing right-wing narrative, but seizing the initiative and telling our own story. We painted a vision of a different society, and we went door by door, street by street to win hearts and minds. We convinced people and shifted the political mainstream. As socialists, our alternative to the division, disempowerment and rampant exploitation of Tory Britain is an open society based on solidarity, in which bigotries and divisions are swept aside, and wealth and power are taken back from the hoarders to be shared out among working people. If we put it forward unapologetically and do the work to persuade people, this is a vision that can inspire. That’s the basis on which Labour must fight to win, and that’s why the Labour Campaign for Free Movement exists.